These lobster fresh spring rolls are refreshing and delicious with succulent lobster meat and crunchy vegetables. The creamy and nutty sesame dipping sauce further enhances the flavors. It takes only 30 minutes to get these impressive rice paper rolls ready. 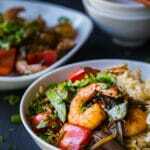 This recipe is inspired by a dish I really enjoy at a local restaurant. They are definitely not any ordinary fresh spring rolls. The lobster is sweet and succulent, wrapped around by green veggies which provide freshness and textures. 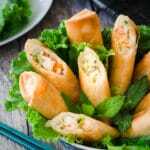 It is like an elevated version of the popular Vietnamese shrimp spring rolls. I always debate between calling these types of rolls “fresh spring rolls” or “summer rolls”. The Vietnamese translation is “goi cuon”. Feel free to call this recipe lobster spring rolls, lobster summer rolls or lobster rice paper rolls. You can serve them as an exquisite lobster appetizer for special occasions to impress your guests. I also eat them as a quick and healthy main dish in summer. 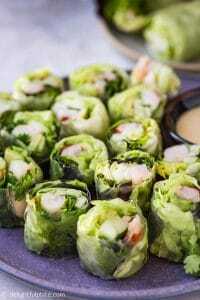 To make these spring rolls, you will need lobster tails, cucumber, avocados, cilantro, lettuce and rice paper wrappers. 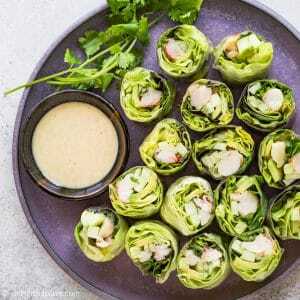 I particularly like this combination of veggies for these lobster spring rolls because their mild flavors complement the mild sweetness of lobsters very well. They also add needed textures to the rolls. It’s best to use soft lettuce such as butter lettuce or baby lettuce because the harder ones may tear your wrappers. The avocado adds some richness and creaminess to the spring rolls, so try to not leave it out. I recently found square rice paper wrappers at my local Asian grocery store and they seem to be a little easier to work with than the round ones. The round wrappers also work just fine. To make the sesame dipping sauce, you will need tahini (sesame paste), mayonnaise, miso, rice vinegar, mirin, sesame oil, salt and pepper. You may need a trip to your Asian grocery stores to purchase miso and mirin. I would start with whipping up the dipping sauce first and then refrigerate it while preparing the rolls. All other prepping steps are easy and straightforward. You will need to poach the lobster tails for a few minutes and then slice the lobster meat into strips. Slice the avocado and cut the cucumbers into matchsticks. And now we’re ready to roll! We start shaping the rolls by wetting the rice paper wrappers. Just briefly dip them in water to soften them. The photo below shows you step-by-step of wrapping these lobster spring rolls. Detailed instructions are in the recipe card as usual. 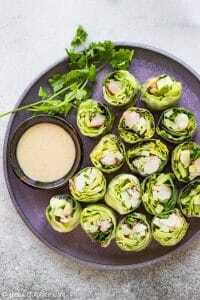 Another fresh spring rolls recipe you may want to try is Bo Bia (Vietnamese fresh spring rolls with jicama and eggs). Fried spring rolls are also very tasty, such as these mayo seafood spring rolls (nem hai san). Whisk together all ingredients to make the dipping sauce. Add salt and pepper to taste. Set aside or refrigerate the sauce until ready to serve. Add water to a pot and bring it to a boil. Lightly salt the water and then add lobster tails, reduce heat to a simmer. Lobster tails should be fully covered with water. Poach for a few minutes until lobster is just cooked through. Remove lobster tails from the pot, extract the meat and slice into strips. Cut cucumber into matchstick and slice avocados thinly. Set up a work station with all ingredients to make the spring rolls and a plate/bowl with clean water. Briefly dip the one rice paper wrapper into the plate with water to wet it just enough to soften it. 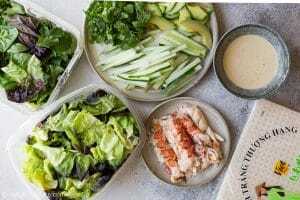 Add a layer of lettuce, then avocados, cucumber, lobster strips and cilantro. Fold the top part of the wrapper near you over the filling and then roll it up away from you. Place on a serving plate, seam side down. Repeat with remaining filling and wrappers. Serve the lobster fresh spring rolls with sesame dipping sauce. You may cut the spring rolls into shorter pieces before serving. It is best to use soft lettuce such as butter lettuce or baby lettuce. The harder ones may tear the rice paper wrappers. 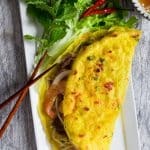 If you use round rice paper wrappers, in step 4, after folding the top part of the wrapper over the filling, you may need to fold the left and right corners of wrapper over the filling as well. I can make 5 large spring rolls (about 8.5'' long) with the amount of ingredients in the recipe. I use square rice paper wrappers but the round ones are also good.